To and from school, easy 10k run with x-country junior varsity boys. Cool, but humid. Felt pretty good. 70 minutes with 6k tempo run at 4:40/48/47/38/32/23. Legs a bit heavy, but felt ok. Some rain, but even without the rain, the humidity is sort of oppressive. Been this way all week. Quads tight, legs very tired, but a nice day! 51 mins, 10k with 4 mile tempo run on slightly hilly course with 3 varsity girls (not the top girl, who was running 6:20 miles). 5,000m time trial on a track. 20:28, 24 seconds slower than last month. Very humid, but also legs didn't feel very fresh due I guess to the tempo run on Monday. Also had no one to follow. 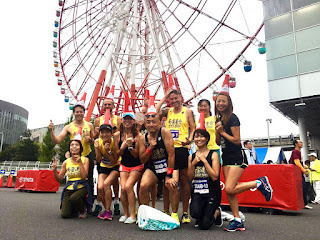 Almost everyone ran slower than last month, although we did have 8 under 19:00, including a 3-time olympic woman triathlete (Kiyomi Niwata), who ran 18:29 as a tempo run. 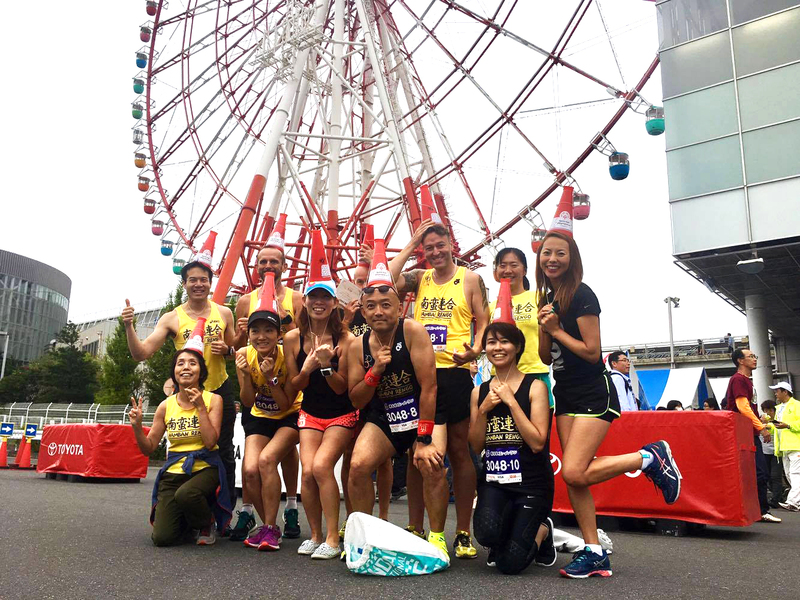 Charity ekiden to benefit the Special Olympics. Teams of from 4 to 10 run a 1.1km course for 3 hours, and there's a chip in the sash that keeps track of each team's total distance. An electronic board updates the team standings each lap, which is fun and interesting to watch. We put in a team of 5 men and 5 women and surprisingly came in 5th out of 184 teams. 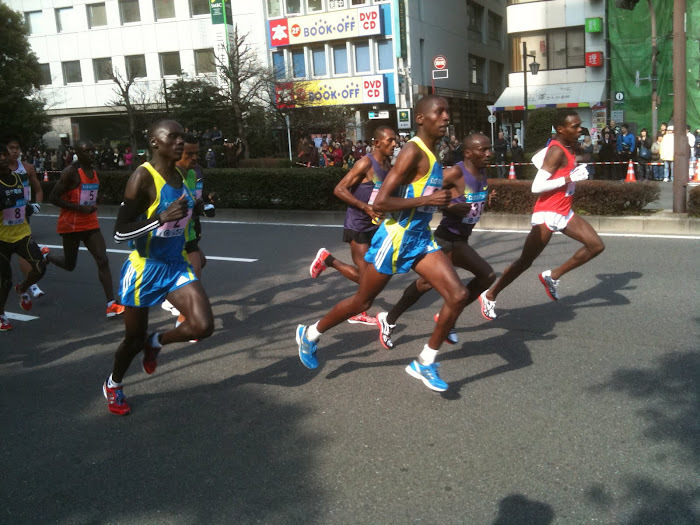 Not a high level race, although the top four teams were pretty good runners (all men). 5 people ran 3 times, and 5 ran 4 times. I was planning on just an easy, fun day, jogging a lot in between, but our first runner came in 8th, then the second guy brought us down to 5th, so Christ, I guess we'll have to go all out to keep this place. Which we did - go all out on each lap, I mean. It was cool, but very humid (85%), with some light rain, so not easy running. Lots of fun, though. We got a podium (stage, actually) finish for 5th, although our prizes were only small red megaphones. Easy 45 min run, 6.5k. Nice day! 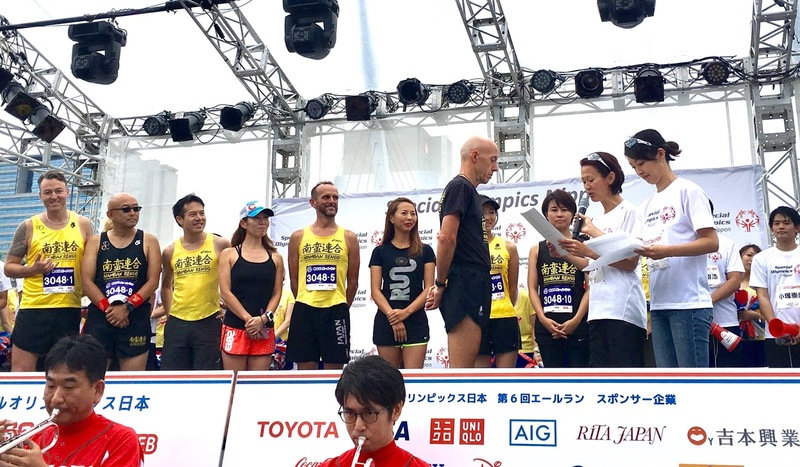 Receiving certificate from Olympic marathon medalist Yuko Arimori. Nice going Bob. Funny about getting sucked in to going all out. Our club shirts are predominately yellow too - good colour for standing out well in race photos.